Sue Buzzard is a violinist and Berklee alumna from the east coast who recently interned with The Monterey Jazz Festival in Monterey, CA. * In the second and final post, Sue evaluates what it was like living and Monterey and how the festival went as a whole. Complimentary Housing: Many thanks to Jim Costello, Monterey Jazz Fest board member who has contributed his residence in Pacific Grove to the past three interns. Staying there rent-free was an enormous asset. Distance from housing to office/fairgrounds: Bring a car, or get a ride. You cannot walk or safely bike to the office or the fairgrounds, as it requires crossing the freeway. I carpooled from Pacific grove with both Rob Klevan and Jan Stotzer. Proximity to the ocean: Gorgeous view, but it gets cold since you’re by the bay. I thought all of CA was warm and sunny. That’s just LA. Bring a sweater. Sue Buzzard is a violinist and Berklee alumna from the east coast who recently interned with The Monterey Jazz Festival in Monterey, CA. * In the next two posts, Sue evaluates her internship and what she learned in the process. I’ve been settling into my new life in Boston the past month and looking ahead at possible projects. I haven’t spent much time thinking about Monterey- only to understand more about what skills it left me with and what I now have a hunger to develop. For my final reflection, I’d like to list my personal pros and cons of interning at Monterey. Fantastic work environment: Impeccable office, clean and organized, respect and enthusiasm from each member of staff. Freedom to complete tasks: Bill’s tasks were direct and to the point, but he was never a clock watcher over my shoulder. He didn’t have time to be, so he had to trust that I was working efficiently. Trust and insight into the festival’s innerworkings: As an intern I was a member of staff, and attended weekly meetings and updates. No information was ever purposefully withheld from me, and if I inquired about details, responses were informative or politely curtailed. Example: I asked how the gala was organized and run, and what purpose it was for. Both Eva and Paul gave me answers and told me what the event meant for the festival. Limited potential for tasks: My stay was only for 5 weeks, essentially the last mile of the marathon of festival prep. There was only so much I could do to help. With a longer internship (all summer? ), I could’ve gotten even more experience and contributed more help and ideas. Enthusiasm: I did my best to put energy into every task, and pump myself up so as to stay focused on getting things done quickly and efficiently. Professionalism: I treated everyone with respect, and asked for help when I needed help on a task. I tried to stay away from “do it all myself,” especially when I knew that I lacked expertise on certain office software required for the job. Proactivity: during the festival I spent as much time as I could backstage. Sue and Timothy Orr, awesomest dude ever. Studying how the crew worked and talking to the stage managers about their jobs. I was going to learn from as many people as possible, I decided, and asked everyone for details about what they did. Timothy Orr, who should’ve been mentioned much earlier in this blog, is head of press and gave me great info. Lack of Skills: Working in the MJF office meant using Microsoft Office and Excel. If I had better understanding and skill in spreadsheets, and more experience working in an office, I would’ve been able to get tasks done by myself faster, and Bill wouldn’t have had to break down so many jobs for me. Less Communication: I have a fear of being wrong, or of doing the wrong thing. I let that fear get in the way of informing Bill and at times others of problems or uncertainties I was having. I was sure in the things I knew how to do, but when I was unsure, I procrastinated asking for help, trying to learn how to fix the problem myself. Sue Buzzard is a warrior of the acoustic string music revolution. Following her studies in classical and jazz music techniques in her hometown of Buffalo, NY, she studied a plethora of violin sounds at The Berklee College of Music. Sue graduated with a double degree in Violin Performance and Professional Music in the spring of 2010, and has since been performing and seeking more ways to bring string music to the masses through production and education. Sue is on faculty at The Rivers School Conservatory in Weston starting this fall, where she will teach Jazz Violin. So, yes. Hiromi was fantastic on Friday Night. And the view from backstage is awesome. It’s like a whole different world back there, looking through the little peepholes they cut in the backdrop. There’s so much to say about the 54th Monterey Jazz Festival, which has now come and gone. Most importantly, I have to say that I had a great time – and I was able to do so thanks to my volunteers. Figuring out how to distribute credentials and wristbands, and how to tell five different people every day what to do in order to get that done, has made me feel incredibly confident in my leadership abilities. And I’ve learned more about volunteer coordination. Don’t get a lot. Just get a few good ones. 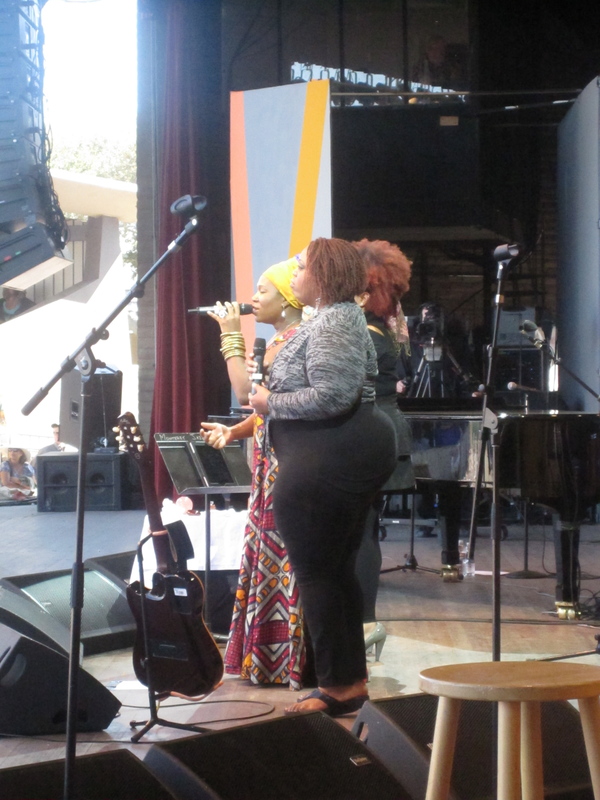 The good ones get to go backstage and see India.Arie. Over the course of the weekend I grew more into my role as Production Intern and Problem-Solver for anyone who came through the door looking for passes and tickets and whatnots. I went from relying completely on Bill Wagner for tasks and duties to having several people rely on ME for tasks and duties, and not needing to assist Bill with things during the festival. Occasionally we’d pass each other in the office going different directions, and give a busy nod of acknowledgement, or I’d step into the office to send an email and he’d be there, putting out another fire. I guess I’ll never really know everything that Bill had to deal with during the festival, but I can tell you it was a lot. Finding credentials for people is hard. Sometimes. This weekend…I can’t even begin to attempt to predict what the weekend will be like. Singing showtunes under my breath and hiding in my office after delegating my volunteers has kept my head on straight for the most part. It’s not as if my sanity is hanging by a thread. More like, I don’t feel as sure of my footing for the actual festival weekend as I’d like to. But Karin and Greg have both helped me keep tasks in perspective. One: you can only do so much. If we don’t have your documents, we don’t have your documents. Now, I hate leaving another person’s problem unsolved, but as it was pointed out to me, “we did our job and it’s all we can do. It’s [the distributor’s] problem now.” So, learn to live with it.